There are many things of interest to be found on St. Croix for lovers of nature. Tourists visiting the islands will find that it is one of the best locations in the Caribbean for those looking for Eco-tourism. A 15 acre natural wonder that is privately-owned but open to the public. Try hiking around the east end beaches beyond Cramer Park Beach ( Caribbean Dream is just 15 from here) or the rainforest and hills surrounding Blue Mountains, which at 1,096 feet is the islands second highest point (Mt. Eagle is the highest, with 1165 feet). Olasee Davis conducts group hikes (30-person maximum) on Sundays and holidays at a charge of US$15 per person. The itinerary changes regularly. Contact him at 778-9491 or 772-0325. 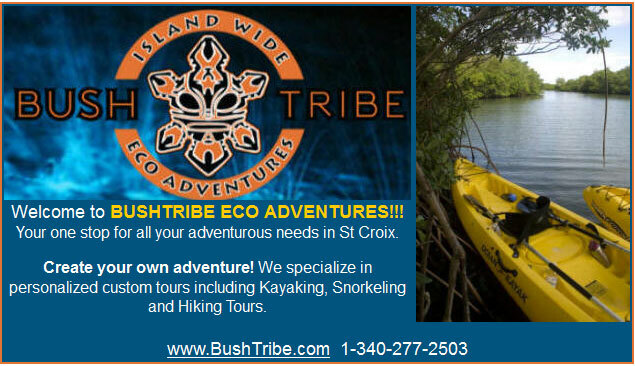 The St. Croix Environmental Association (SEA) offers guided hikes into the Caledonia rainforest and in the Salt River National Park on a request basis. 340- 773-1989. St. Croix Heritage Tours (guided) - 340-778-6997, 719-9079 - Custom tours through plantation ruins, lush tropical forest, quaint historic towns, sugar mills and massive forts. Frederiksted -340-772-0357 (and info booth on Frederiksted Pier). Sandy Point National Wildlife Refuge (call them for details, tours, etc). The turtle nesting occurs at night.